I want to share with you some snapshots showing the stunning landscapes and breathtaking views that you can find along la Ruta del Sol in Ecuador. Imagine spending a week, exploring miles and miles of gorgeous beaches. Each one of them with special features. 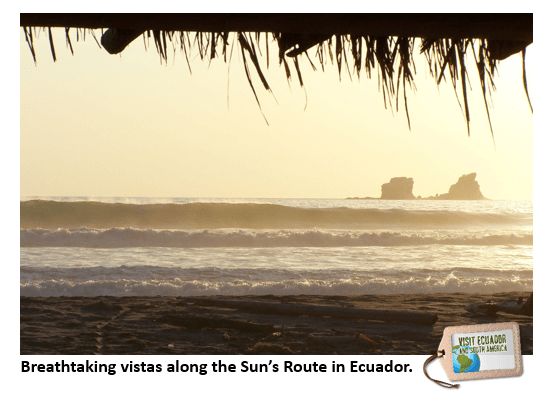 This is what you enjoy along the Sun’s or Spondylus route in Ecuador. The best way to do this route is by car. I have done it first by bus, but if you want to stop and take pictures at your own tempo, rent a car. You can either take a bus or fly to Manabi and from then you start your road trip South. Another option is to start the route from Guayaquil and head North to Manabi (province). Read here a full article with some of the things to do in Manabi. In addition you will find lots of unique ecosystems with lots of flora and fauna. As well as plenty of opportunities to enjoy fishing, sailing, surfing and even whalewatching in the months of August – September. This is a region that has lots of history, as some of the oldest cultures in South America settled here. If you want to relax or have a fun time while enjoying the warm weather, la ruta del sol givs you all this and more! Ecuador has some amazing and beaches waiting for your visit!